I have been receiving lots of questions from teachers, parents, caregivers, friends and family of females with Rett Syndrome all over the world. I have heard from Sweden, Italy, Australia and the UK, so I decided to answer some of them on this page. They may be of help to you. We are going to summarize the questions so no names are here, just my answers. I am so happy i found your blog. I live in Sweden an my daughter who has rett syndrome. She is 15 now. I have always said to others that she understand so much more than they think but not many believe me. You lifted my heart and spirit by telling the world you du NOT funktion in an early infant level! I will tell my girl about you and i know she will be happy to hear your words! You are a brave girl and will, i am sure, help many many silent people around the world and hopefully change the way others think silent is the same as ignorant. Take care and I hope you will find caregivers who will see what a wonderful and precious person you are! My daughter, _____, has RS. She is nearly 5. I am interested as to how you type. She has a touch screen computer, but she struggles to make choices on it as she uses her thumb to press, and her whole hand ends up touching the screen – she can’t be precise. She is starting school in September – at our local mainstream school- and I am considering buying Intellikeys so I can create her own keyboard – but I would only be able to put a few letters on it as she essentially uses her whole hand to make her choice. I would be grateful for your advice. I am so glad for____ that you are her mom. I had an Intellikeys when I was younger. I think it was too limiting for me. I know there are females with rs who are able to be more precise than others. I am not able to type without facilitation because I am not able to hold the keys for the right amount of pressure and time. It was frustrating for me when I was expected to use a keyboard independently. My hand curls up too, but if someone holds my right hand and helps me isolate my pointer finger, i can type very fast. It doesn’t happen with everyone who tries, but for those who are persistent, I am eventually able to express myself freely. If _____knows you believe in her she will try everything she can to can to communicate with you. I think girls with rs are often labled as having low intellect because we are expected to operate independently. It is usually not possible for us, because our hands don’t listen to our brains very well. Give _____ a hug from me. I hug by bumping people with my head. This may be surprising to you, but I am communicating using facilitated communication. (FC) I have Rett syndrome and I am 22 years old. I had no way to communicate before I was nine years old. If you are interested in your daughter using FC, I would encourage you to go to this website. www.williamstillman.com There is a lot of information there. Bill is my friend and he has Asperger’s. If you want to know more about me, go to my blog at www.spiritdances.wordpress.com I just started it two weeks ago and it has been amazing to me that people are interested in what I have to say. Please don’t let your daughter live in silence. With FC, I have become a happier, healthier, involved person. I’m not feeling well today so I don’t have a lot of energy, but please don’t worry about costs for FC. I use an old detached computer keyboard that was given to me. You can use a paper with a keyboard printed on it. Don’t worry about what others think of FC. Try it for your daughter. It has given me a life. I have a question about my six year old granddaughter. She is so sweet and beautiful. She said a few words when she was around two, but none since then, and never in front of her parents. Also, she has almost no muscle control – and it’s getting worse. I’m at a loss as to what to get for her birthday. Do you know what I can get her? I want to make her happy. We love each other so much. She also bumps heads. I’m glad to know it’s a hug. I remember when I was six. I was scared about a lot of things. It was at that time that teachers were deciding what I was capable of doing. I was so much more intelligent than they knew. If you give your grandaughter gifts that are for someone her age she will likely not be able to handle them like someone her age. It doesn’t mean she’s not intelligent. I still have things I chew on because I can’t stop myself from chewing. I have a miss Piggy in my bed for when I wake up and need to chew, and I wear bandanas all day long so my clothes stay dry and i can chew on them. I think getting her something that is inspiring to her like a movie for her age and something to fiddle with, will give her mind and her hands something to do. I fiddle a lot and it calms me. I like shiny objects. I have a 21 year old daughter who has Rett Syndrome. We found out about Facilitated Communication when she was 5 and you will know what difference it made to our lives. I kept saying that I couldn’t believe she was the only intelligent girl with Rett’s and I am delighted to hear that you are broadcasting that loud and clear to the world! I am intrigued by the fluent and grammatically correct and wordy style to your writing. Have you always written that way? My daughter’s writing is not nearly so fluent and the way she uses language is distinctive. She likes complex, old fashioned words and it takes so much effort to type that she is very concise and what comes out is poetry rather than prose. Words come out in the wrong order and it doesn’t always make sense. We have to work over and over on each sentence to clarify her meaning and to get it to end up saying exactly what she wants in the way she wants. Would you be able to tell us how it is for you? My Response:How wonderful to hear of another Rett girl who uses FC. I have a friend who lives near me with Rett who is also able to use FC. She isvery intelligent and we have great visits when we are able to see each other. At one time I used to use words that were more complicated than I do now. As I listen to people I have learned how to imitate conversations that are spoken. I also have limited vision but I can see up close. I am so glad you wrote to me. It is frustrating to me to have people believe that girls with Rett have low intellect. Your blog has reached out and touched us here in England. 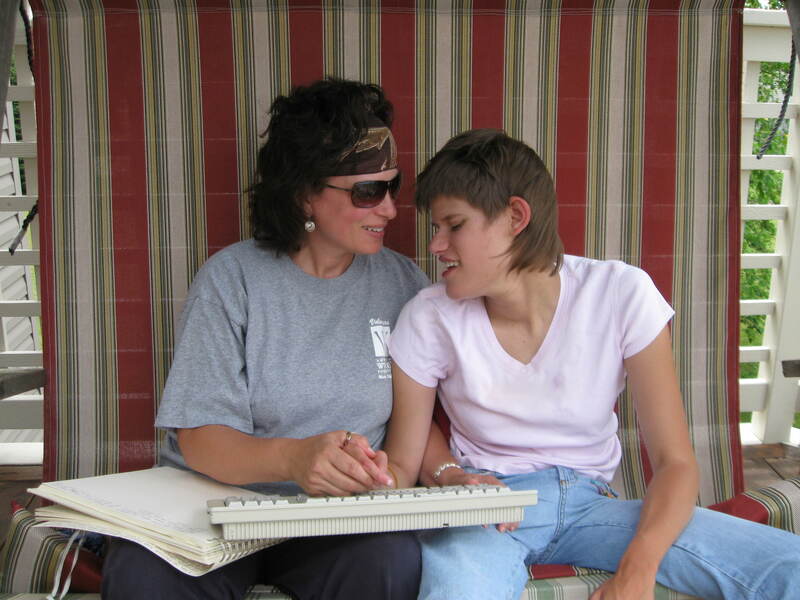 My 44 year old daughter Tammy has Rett Syndrome and has been using Facilitated Comunication for 16 years now. I was so excited when I found your website, finally someone is bringing Rett girls together who are able to communicate. THANK YOU from the bottom of my heart. people not believing she was capable of communicating, being attracted to sparkly lights, and Tammy’s special love for music and animals. Tammy typed: “Sa I am really impressed. I need a frend” Then she was c ompletely overwhelmed by everything and couldn’t continue. We live in Rhode Island, Tammy moved into a group home with 2 women her age last year, and she is attending an Adult Day Prom 4 days a week. This new small group home and day program with the elderly has worked the best for Tammy. We have tried other group homes and workshops but Tammy was not happy. My husband and I are visiting Florida for the winter. Tammy arrived with a worker from the group home, and will be leaving on Saturday. I will try to get her to communicate again before she leaves. I sat down with Tammy yesterday and asked her to send you an e mail. Each Day I live I remember crass deaf ears on my life. Each dart thrown at me sailed me into troubled waters. Sad I easily slip away into my own world. Each day I call God to help me. Dead was my life with no one to hear me. Each bear necessity masked by no assurance that I could get my body to respond. Each fear terrified me. Each easy task was years away from me being able to make my body work. Each fear let me get closer to God. Tammy could not continue, her early years have been very hard for her to communicate. Keep in touch and we can share our experiences. It was a delight to read your blog. Very inspirational.My daughter is 6 now and like you have mentioned ,we strongly think she has immense potential to read and communicate and my wife works hard everyday to impress upon this fact to all therapists involved in our daughter’s care. We just bought a touch screen for our daughter and working on the keyboard. Do you have any suggestions for beginner’s like my daughter and share some of your earlier stumbling blocks you have encountered in communication including reading and typing. your story again is a great inspirational one for all parents and therapists involved in the care of our girls. I am from the southern part of the philippines. i am so happy when i found your blog, i was so surprised and blessed by it. I have a beautiful daughter, Katrina Julie, who we actually call kelly. She was diagnose with retts when she was 2 and now she is turning 6 by december. You gave me hope that she can learn a lot of things. Our family really beleives she is more intelligent than what the doctors said. That she understands a lot on what is going on around her. you inspired me and i thank God for that. you are indeed a light to us. thank you. First of all I want to tell you that you inspire me and my daughter Brenna. My 14 year old daughter Brenna was diagnosed with Rett’s on 6/11/09. Since then I have been on a mission to heighten awareness. Please take a look at my web-site and let me know if you have any ideas to share with me or if you would like to help. Myself along with 7 other Rett mom’s are working on this campaign, I would be happy for you to join our team. Take a look at the web-site and let me know if this may be something you would be interested in. Thanks so much and thanks for being the incredible person you are to share your gift that gives hope to all the sweet Silent Angels everywhere. I have been “quietly” reading your blog for some time now. My daughter Emma is 3 1/2 and was diagnosed with Rett in September 2008. I am on the Mother’s Advisory Board of Girl Power 2 cure with Ingrid. When I read your words I can honestly say I understand. Emma is so smart and yet, we live in a world where people can be so ignorant. They don’t understand that she is trapped in a body that doesn’t work the way she wants it to. She understands everything going on around her and has an amazing sense of humor. Most of the time people prefer to see the things she is unable to do at this time. Notice I didn’t say “can’t”. We don’t believe in the word can’t. In October we hosted a “Rockin For Rett” benefit concert and auction. We raised a bunch of money to help find our cure. We KNOW that cure is out there and please know we are going to get it. Rett Families are amazing.. I know you know that! Please continue your amazing work. Thank you for helping everyone understand Rett Syndrome. We are attempting to help my daughter with Rett Syndrome to communicate using a My Tobiii system. I am hoping she will be able to do this independently since she has better control of her head and eyes than her hands. Have you ever used a computer eyegaze system? Do you believe it may be easier than FC with your hands? Just curious to know your thoughts. Thank you. It sounds exciting for your daughter! I have very poor vision so in order to see a screen I would need to be very close to it. Another challenge for me is I rock my head back and forth a lot so the eye gaze programs aren’t able to work for me. I breath heavy a lot and while I am holding my breath I have no control over my movements, so I haven’t been able to use eye gaze. But I hope it works great for your daughter. I have a Rett friend who is much calmer in her body than I am. It seems like it might work better for her. Her mom is checking into it. Thanks for leaving me a message. thank you so much for sharing your thoughts & feelings. It helps me to understand better what my daughter, Jaime is going through. She has similar hand movements to you. Her right hand is constantly tapping her chest or a book or toy if they are in front of her and at the same time her the fingers on her left hand are constantly fiddling with each other and she is constantly raising it to her mouth. If I put a glove on her hand her fingers stop and I sometimes put a splint on her arm to stop her hand going in her mouth, if her face and hand are becoming too sore from constantly being wet. I am wondering if doing this to help prevent her doing these things are a relief or whether it could be more frustrating for her to be restricted. She doesn’t complain when I put them on. Her favourite toys are the fisher price power touch learning system & the little touch leap pad which are books that are activated by being touched and they tell stories & play music and say different things depending on which part of the picture you touch and what setting you have it on. I believe that because the words are on the page and it tells you the word when you touch it that she already has quite a good understanding of words & letters and numbers. The seizures seem to start about an hour after she gets to school and generally once they start they become rolling until I take her home and then they stop and she is fine for the rest of the day. I have been thinking a lot about them and have a feeling that maybe something about the environment at school is triggering them. She enjoys school and is learning well. All the kids love her and include her in everything they do and she thrives on being the centre of attention. When I ask her if she wants to go to school or stay home she wants to go. The classroom has become a lot busier as the year has gone on, as new kids start when they turn 5 and the class has grown from 13 when she first started to about 18 now. I don’t know whether this could be contributing. She has a fantastic teacher aide who talks to her and treats her with the same respect she would any other person. She is also very passionate about Jaime having dignity and ackowledges her feelings and emotions. It was very exciting to meet Susan Norwell in May this year when she came to NZ to speak at the Rett Conference. We have got a meeting with someone from talklink coming up very soon to assess her for some kind of communication devise. I need to try and convince them that she needs something similar to what Susan had that can be programmed to talk when you touch it, as Jaime is much more motivated with something that talks than just plain pictures. I hope this isn’t too long and tiring for you to read and I would really appreciate feedback on the glove and armsplint if you are able to. I don’t know whether it is something you have experienced or not to be able to comment on. My daughter is a sleep at the moment as it is after 2am but I am going to read her your blogs as I think she will really appreciate hearing from someone who can understand what she has to deal with. I am so glad you wrote to me. I’m having a good day today, so I decided to respond right away. I have had many problems with seizures too, but they come in a row, then stop. Your daughter is so fortunate to have you for her Mom. You sound very loving and interested in helping her come out. I love Susan Norwell. She is a great person. I am so glad she got to your country for your conference. I have never used an arm-splint so I don’t know what they feel like, but I do have a friend who uses one and it helps her stop fiddling so much. It helps her type easier. For me things that restrict me too much make me feel really anxious. I have found thought, that sometimes when I wear my leg braces for walking that even though they hurt sometimes, that it helps me feel more calm. When I was in school and there were a lot of students, and noise and activity, I would feel overwhelmed sometimes. I would feel so stressed when I was young and first started having seizures at 5. Loud noises sometimes trigger me to startle and then I feel like I am having a seizure in my brain. I have a low tolerance to loud noises, so it might be too busy for her sometimes. But I also started having seizures when I was very young. When I would smell paint, or new carpets or cleaners or perfume, or especially diesel smells from the busses. I don’t think it’s easy to find out all the answers, but maybe some of these things will help your daughter. Thanks for sharing my blog with her. If she knows you believe in her it will keep her heart alive and eager to show you who she is. I was just wondering if you have found anything that helps with the seizures. I am trying to get as much info about what has and hasn’t worked for other rett girls so as to be able to know which is the best direction to go in to try and reduce the seizures. First I want to thank you for your blog. It is helping know my daughter better. I have a question about leg braces. Jessica (my daughter) is 18 and has retts. the past few years she has refused to let us put her braces on. She will lock her feet in a cruve shape so that we can not put them on. I would like to her your thoughts on wearing leg braces. I think she’s in pain if she’s curling her toes. I wear braces too and mine hurt my feet, but I wear them for a short time whenever I am standing or walking in my walker and when I’m walking around to get some exercise with someone supporting me. I’m glad you found my blog and that it is helping you and your daughter. It is hard to live with Rett Syndrome. Today I’m frustrated with breath holding. It affects every part of our lives to have a disorder that causes so many challenges. I hope your daughter is having a good day today.